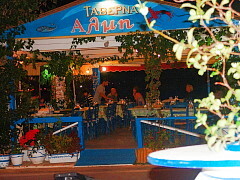 Along the harbour front in Vassiliki are numerous lovely tavernas and cafes - some offering drinks only for your early morning coffees and most offering traditionally freshly cooked Greek Cuisine at very reasonable prices. A great cafe on the harbour waterfront is Deja Vu. Just down the bay from Vassiliki located in Ponti overlooking the sea on the beach is 'Taverna Almi' which we highly recommend. At Almi you will not see appliances like microwaves. Maria and her experienced and dedicated team in the kitchen cook everything from fresh and the food is absolutely delicious. All food served at Almi is grown / reared locally on the Island and is cooked using locally produced olive oil. The fish at Almi is caught daily by local fishermen, so you cannot find fresher fish on offer. Aris, George and Angelo will offer you a very warm welcome on your arrival for lunch or dinner and they will ensure you are wined and dined to the very highest standard in an extremely friendly and warm environment. All our clients who book their holidays through us will be issued with a Voucher which when presented to Taverna Almi will entitle them to a 10% discount off their bill - every time you visit the restaurant. Taverna Almi offers a full range of soft drinks, beers, coffees and locally produced wines.